The jury started deliberating today, back at it again tomorrow. The defendants have to sit in cells while the jury is out. Locked up before being convicted – good one, justice system. All 3 have been found guilty of various charges – not all charges, but enough for serious risk of prison time. I don’t have all the details. What was wrong with the jury? 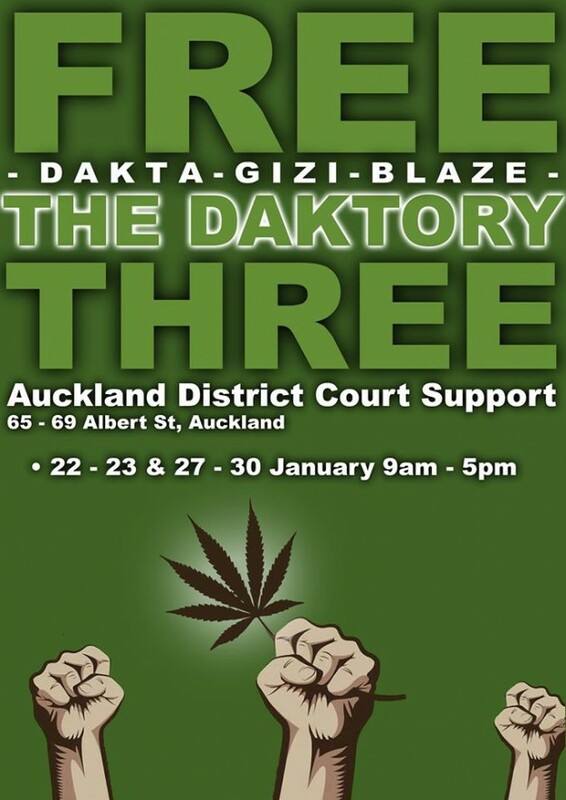 How is it possible in 2015 for a random group of 12 people to not include a couple of stoners who would refuse to find them guilty? With polls showing a huge majority in favour of cannabis law reform – what’s going on here? I have heard a saying about juries being composed of people too stupid to get out of jury service. Maybe it’s true. Just gotta keep on sticking it to the Man. The Man is the one doing the sticking. Dakta Green’s motel unit was raided after bogus complaints invented by corrupt police. They are playing dirty now. There are still unanswered questions about evidence important to the defense which has mysteriously gone missing. Sentencing for the Daktory 3 is on April 22 at Auckland District Court. If you want to stand up for your rights, be there if you can.